I’m Monica and I have a fashion and travel blog called 45 Fairmount. 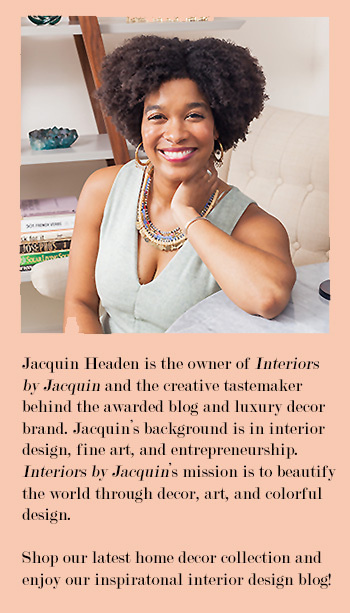 I am so excited that Jacquin asked me to participate in her Fashion meets Design series featuring this wonderfully, colorful room design as inspiration! I started 45 Fairmount about a year ago as a way to share my travels and fashion finds and inspirations. Ever since I can remember, I have been inspired by fashion and design. I grew up traveling back and forth from Kansas City and Barcelona and I knew early on that there was a difference in aesthetic and trends and this fascinated me! 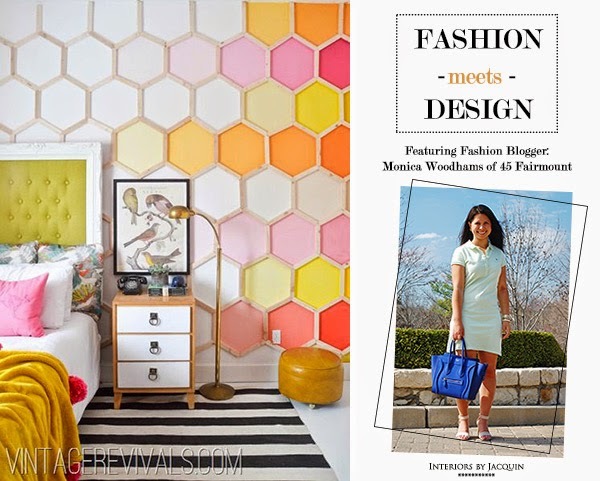 If you’ve read 45 Fairmount, you know that I describe my personal style as a combination of style and comfort. This doesn’t mean stylish yoga pants. I mean wearing what I feel most comfortable in, because I’m always running around the city or traveling, in a chic and stylish way. My favorite outfit is my favorite pair of Joe’s Jeans or Rag, sandals with a heel, and an Elizabeth & James tee. When I saw the image of this citrus inspired room, I knew exactly what dress paired perfectly with the room. 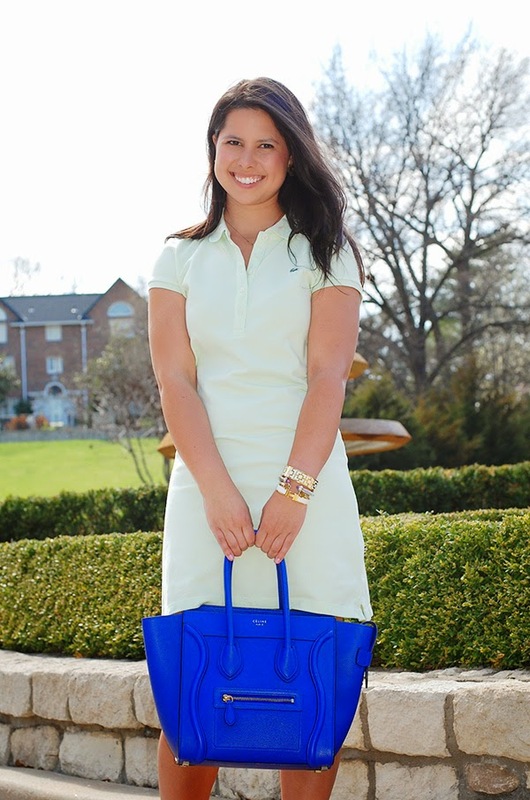 This Lacoste dress is an oldie but goody. I’ve had it for forever because it’s such a timeless staple and the shade of green is a beautiful spring color. 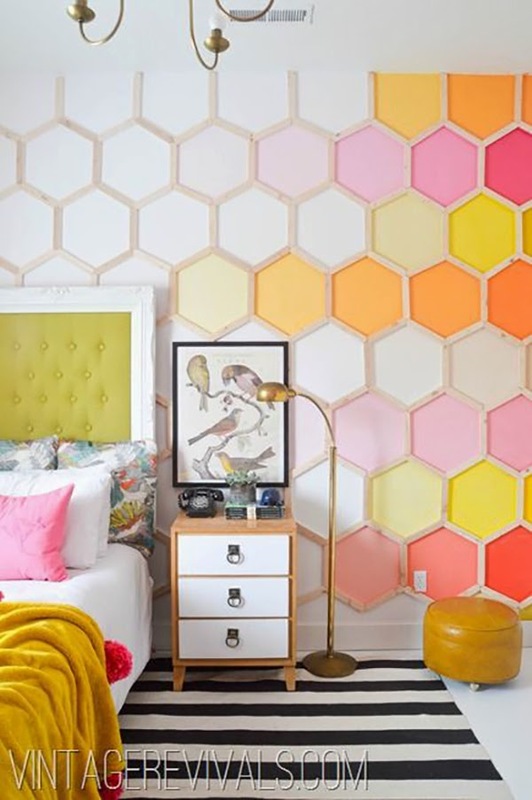 I love how this room has different shades of pastels to brights. 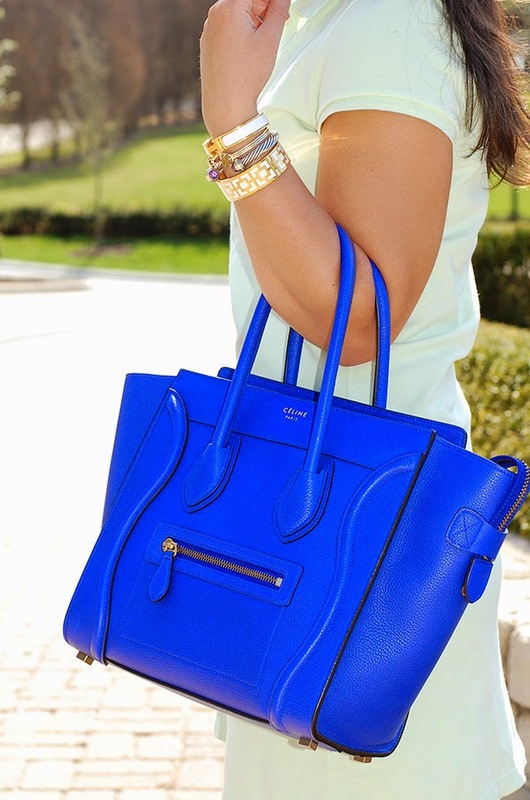 I kept this soft to bright theme in my outfit by accessorizing with the bright blue Celine bag. Sometimes it’s really fun to combine two colors and see how they make each other pop! (1) Don’t be afraid to throw in a punch of color by way of your accessories. I love the idea of a soft outfit with a bright and bold bag or shoe. (2) Keep it simple. For this outfit, I wanted the focus to be on the color of the dress and the bag. For jewelry, I kept it simple with gold and white jewelry and avoided any colored bracelets.